Since 1995, our Working Leadership program has been training managers. More than 1200 have graduated from this program in managerial leadership. This six week behavior-based program covers the essential skills that managers are never taught. If you would like more detail about the curriculum in each of these subject areas, just ask here. I will send you a more colorful sheet. Each session is 3-1/2 hours and includes field work assignments between sessions. This program is intended for Hi-S-II supervisors and S-III managers. The class will be held in Austin, TX. Your coach for this program will be William Foster. William has been in the classroom for 27 years, is a Board Member of the Caldwell Independent School District, and received his certification to teach this program in 2016. Space is limited to 15 students. If you have an emerging manager in your organization that would benefit from this program, you can pre-register here. Program tuition is $1600. Vistage members receive a $100 credit per participant (includes all materials and textbooks.) VISA-MasterCard accepted. If you have questions, would like more information or if you would like to pre-register, please drop me an email or follow this link. Role of the Manager. Introduces the distinction between supervisor and managerial roles. Clarifies the specific goals necessary for effectiveness. This module creates the foundation on which the rest of the course material builds. 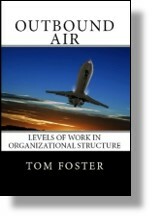 Incorporates source material from Requisite Organization – Elliott Jaques. Leadership Styles. Participants will complete a DISC survey (DISC is an online instrument published by TTI) and report on their own identified strengths and working style. Positive Reinforcement. This segment reviews the management research of Elliott Jaques and Abraham Maslow regarding “why people work.” Explores the role of positive reinforcement outlined in by Aubrey Daniels – Getting the Best Out of People. Delegation. Participants are introduced to a specific model of effectivedelegation. Most managers hold certain mental blocks to delegation that prevents them from using this powerful developmental tool. This delegation model challenges these mental blocks so the entire team, manager included, can benefit from delegation. If you would like to find out more about this program, please drop me a line. This entry was posted in Leadership, Programs and tagged leadership training on August 7, 2017 by Tom Foster.